Training involves a step-by-step methodology called Dragon Rolling the Pearl. Divided into four sections, this program ensures that the student develops all the fundamental principles and skills that are the cornerstone of the art. In Section 1, the student begins learning to release unnecessary tension and develop proper structure of the body through stances to create a very solid “ground path”, which is essential to being able to generate force. Quiet Sitting exercises develop discipline of the mind and to develop the ability to use Intention and Attitude (Yi and Xin) to enhance any physical action. The Dragon Rolling the Pearl arm configuration is introduced and practiced with various stances to learn the best pathways to bring power from the ground to the hands. Section 2 continues the studies of Section 1, and the student begins learning how to use the entire body as an integrated unit to generate Whole Body Power. Exercises with Shifting and Linear Walking are studied, often using a partner to test the ability to issue force, while continuing to integrate principles of correct body mechanics to ensure the student can express the full force of his or her body from any position on demand. Section 3 introduces the hallmark exercise of Baguazhang – Walking the Circle. In this phase of training, the student begins taking the skills developed in the previous sections and learns to move them in a free-flowing manner, adding momentum to the already powerful structures. The skills introduced in this section allow the student to move and change in any direction with no loss of momentum. Partner games are practiced while walking the circle to develop sensitivity and to learn to change based upon what the opponent presents. 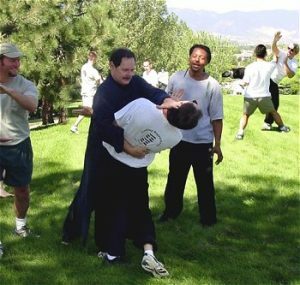 In Section 4, the student takes all the previously learned skills and begins applying them in various self-defense scenarios. Escaping from grabs, neutralizing punches and kicks, and countering with strikes, kicks, joint locks, and throws are studied, along with strategies for dealing with multiple opponents. More advanced two-person combat games are practiced, while equipment training, striking targets, and power-issuing practices ensure the student has genuine “stopping force” at their disposal. Upon completion of this course, the student will be ready to embark on a journey that explores all of the Palms of Jiulong Baguazhang, weapons training, Qigong, and much more!